Mike Pate is a fifth generation Southeastern Oklahoma native. Mike was raised in the cattle industry and currently operates a 300 acre ranch with his wife Anna of whom have been married for 30 years. Mike was raised living off of the land through hunting , fishing and ranching. After Graduating High School Mike went on to attend Southeastern Oklahoma State University and earned a B.S. degree in Wildlife Conservation. Mike has combined his experience of ranching and conservation to round out his knowledge of the flora and fauna of Oklahoma. Mike has over 25 years of experience in preparing lands for use of all types of live stock as well as preparing that perfect piece of hunting property to maximize numbers and quality of your favorite wildlife species from white tailed deer to Eastern Turkey to trapping such as bobcat, coyotes, raccoons, beaver. 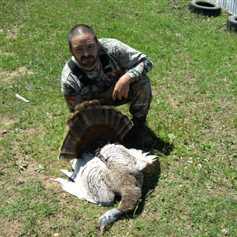 Mike has hunted, fished and trapped all over Southeast Oklahoma.